It wasn’t long after acquiring our first batch of 6 red cherry shrimp that I started to look for a good way to feed them. I had heard that you can offer them blanched vegetables, like sweet potatoes or zucchini; I gave that a try without much interest on their part. Also, I didn’t really want to fiddle around with preparing a custom salad for them every day. A trip to the local fish store sent me home with a great packaged shrimp food from Hikari called “Shrimp Cuisine”. Hikari Shrimp Cuisine is a granular shrimp food that is very easy to feed. It is small enough that even baby shrimp can nibble away at it. It’s hard to describe the size, but it is basically larger than sand but smaller than gravel. 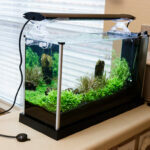 Shrimp Cuisine sinks so that it is easily consumed by the bottom feeding shrimp. Those who are familiar with keeping inverts such as shrimp will take note of the red flag above. I checked the ingredient list and sure enough, copper sulfate is listed as an ingredient. It is known that copper can be dangerous and toxic to shrimp and is generally avoided, so feeding them food that is known to have copper is a bit of a faith jump. Apparently, the opinion of Hikari is that small quantities of copper is actually beneficial to shrimp and does no harm. I can’t vouch for the benefits, but I have not seen any harm in my red cherry shrimp colony through the use of this shrimp food. 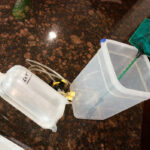 Shrimp Cuisine is a very simple product to use, but I wanted to offer a few tips for feeding your shrimp. They say on the instructions to “Feed multiple times daily, the amount your shrimp will consume within a few minutes.” I agree with the part about only feeding what they can eat, but I’m not sure about feeding multiple times a day. Before our crew of RCS started to breed, I hardly ever fed them as they managed just fine on the biofilm of the aquarium. Now they have increased in number considerably so I have stated to feed more consistently. I manage to feed the shrimp most days, but not every day. It probably works out to 5 times a week. My view on adding food for the shrimp is that I want to provide them what they need to survive, but still have them hungry enough to do what they are supposed to do, and that is scavenge for their food in the tank. If they rely entirely on the packaged shrimp food, they will not work on cleaning up some of the algae on the tank surfaces. 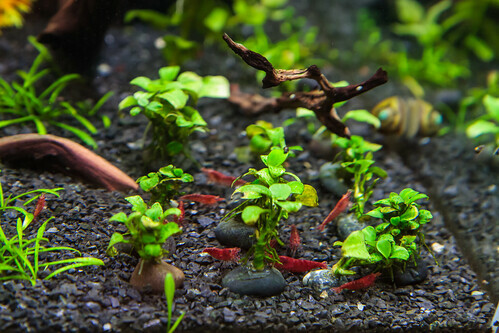 Red Cherry Shrimp aren’t the best algae cleaners, but they do contribute. The food granules do sink, but if you just drop them onto the surface they will float. I finally discovered that it’s best to place a few granules between my fingers, lower the fingers down below the surface, then release below the water line. This way, they sink right away and in the location I want. Fish do show interest in the pellets as they sink, which can be challenging as they will steal the food. My green neons often take the food in their mouth and then spit it out; it seems just a bit too large for them. However, they sometimes do managed to swallow it. I combat their theft by placing the food at the corner of the aquarium and keeping my hand in the water until the food pieces hit the substrate. The presence of my hand usually deters them and allows the food to sink fully without theft. Once it hits the substrate, the fish will usually not eat it, although they do mill around in the area from the smell. The food seems to be a decent value to me. It is selling on Amazon for about $10 USD. The bag is small (0.35 ounces, or 10 grams) but I anticipate this will last my colony of shrimp well over a year. I expect other people may use it faster in their aquariums. Do Shrimp Like Hikari Shrimp Cuisine? I was a little perplexed when I first started using this product. I would drop some in and the shrimp paid no attention to it. I just left it in there in good faith that eventually one of the shrimp would clean it up. What I am learning is that it takes awhile for shrimp to discover that something new is indeed food. This is probably the main problem I was having with my first attempts at blanched zucchini. My shrimp colony now shows great interest in this food. When I drop it in, they come within minutes and are soon swarming, fighting over the granules of food. It is quite entertaining. So while I don’t have firsthand knowledge of their opinion of this food, it appears they like it (or they are just very hungry). I only feed a few (3-4) pieces of Hikari Shrimp Cuisine at a time. I have started to drop pieces in opposite sides of our Fluval Spec V Aquarium to ease the shrimp mosh pit that occurs if you add all the food in the same place. 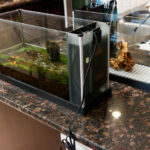 Variety is always good for your aquarium inhabitants, so it’s a good idea to offer alternatives for food and not stick with the same thing day in and day out. Also, some people may be scared off by the inclusion of copper in this product, and that is understandable. Brands that I have heard are good include Ken’s Fish (sinking sticks) as well as Mosura. 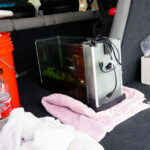 This entry was posted in Product Reviews and tagged copper, hikari, red cherry shrimp, shrimp cuisine, shrimp food. Bookmark the permalink. 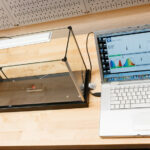 Nice tip…about feeding shrimps when we have fishes already in the tank. I’ve looking for this kind of tip n finally found it…very nice. I found Omega One Shrimp pellets do the trick nicely, and contain zero copper or zinc anything. First time I dropped a few of these in, they were swarmed within five minutes. Like you feeding is sporadic, as the tank is well established with mulm and algae, but they are now breeding so an occasional supplemental feed works. Good suggestion on the food you use for your shrimp. Sounds tasty (for shrimp)!